Brakes are one of the most crucial parts on any vehicle. While it’s important to handle any engine problems that come, it can be argued that brake problems are even more critical since they determine whether your car actually stops. A hydraulic system is used to manage the brake at each corner of your vehicle . This will likely be a disc brake but sometimes a drum brake. When you step on the brake pedal, the front wheel brakes have a bigger role in slowing down the vehicle than rear wheel brakes. The reason for this is that the weight of the car pushes forward when you apply the brakes. Various sounds and vehicle feedback while driving are often the first things we notice when we suspect a problem with our cars. Brake problems are not exception. So what does it mean when you hear a grinding, squealing, or scraping noise when braking or feel a vibration? When you hear an annoying sound such as grinding, rubbing, squealing, or metal scraping sound while driving and applying the brakes, then you may have a problem. Sometimes it might be nothing and the sound will go away on its own. But if the sound is consistent and does not go away or even gets worse, you likely have some type of brake issue. Here are 9 reasons for why this brake noise occurs. 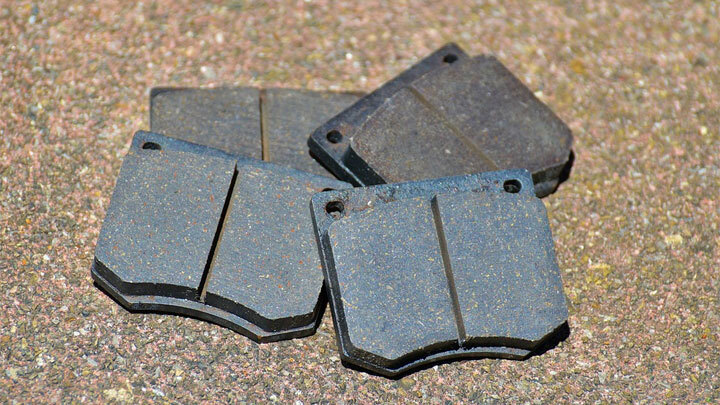 If you hear a grinding sound after you step on the brake pedal, then it could mean that your brake pads are worn out. As the backing plate loses its material, this causes metal to come into contact with the metal on the rotor. Either that or the brake caliper itself may be making contact with the rotor. Whichever one it is, your brakes could become severely damaged if the pads are not replaced. Your rotor could be destroyed by the backing plate, resulting in damage and grooves. The rotor will then do the same thing to the caliper. When your brake pads go bad, you need to get them replaced ASAP. If you’re hearing a grinding noise when braking but the pads are fine, keep reading. Don’t try to save money by purchasing the cheapest brake pads you find. Skimping on poor quality brake pads can literally mean the difference between a near collision vs a totaled car with serious injuries. 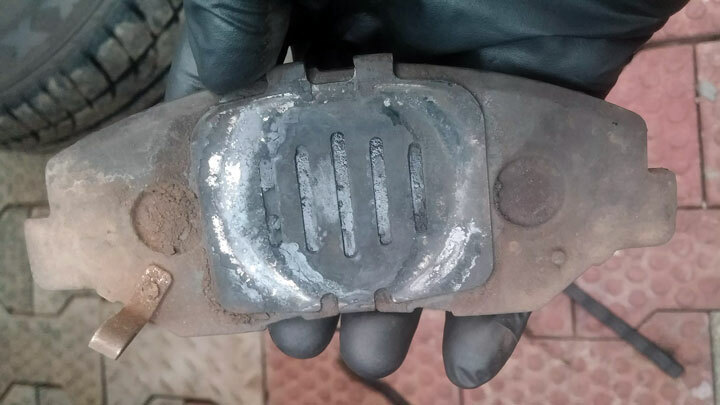 In addition to performance, cheap brake pads are poorly manufactured and can have defects such as metal chunks in the pad material which can scrape against the rotor and cause severe damage. You will save money in the long run by choosing a reputable brand for your brake pads. Some of the best brake pad brands include Akebono, Stoptech, Wagner, EBC, Powerstop, and AC Delco. Any time you get a brake job done or replace brake pads yourself, you must replace the shims. Bad mechanics may avoid this if they want to do their job fast, so make sure they do replace them. Brake shims that are not replaced will eventually get worn down. This can often result in a piece of the brake shim making contact with the rotor or other metal part of the brake system. With metal touching other metal like this, you will hear sounds from your braking system as you drive the vehicle. So, make sure you replace the shims. Your brake system could have debris from the outside get lodged in it. 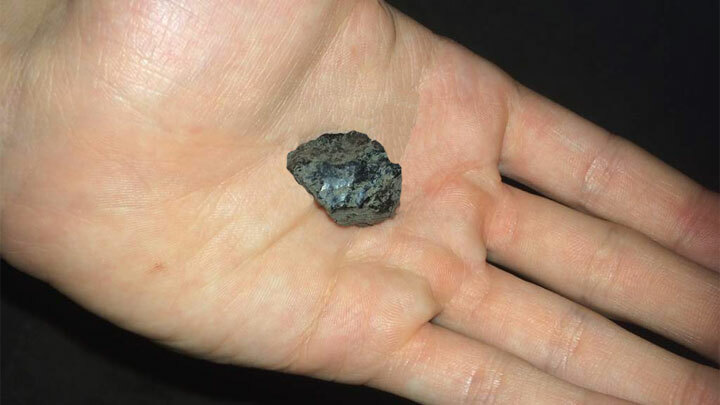 This debris could be a piece of rock or gravel that gets stuck in the caliper. Then, the debris will rest between the rotor and caliper, and cause scraping or grinding noises to occur and possibly vibration. You’ll continue to hear these noises, even if you’re not applying pressure to the brake pedal. If the piece that’s lodged in there is not removed, your rotor may eventually get damaged and will at the least need to be resurfaced and possibly replaced. Something stuck in your brakes can even cause your brake pads to get out of alignment and cause uneven pad wear. In this case, performance is reduced and you’ll need to replace your pads sooner than normal. 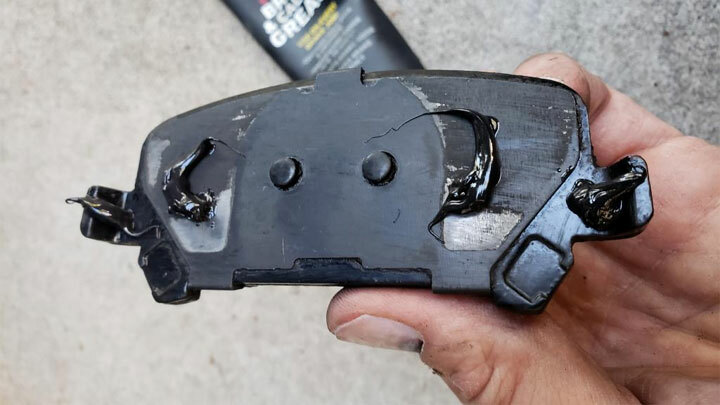 A set of brake pads will usually last anywhere from 30,000 to 70,000 miles of normal driving depending on the type of vehicle and driving style. But if you start having braking problems sooner, then it could be from simply not driving your vehicle enough. If the rotors don’t get used for a while, such as if a car is stored for the winter, then rust will eventually form on them or they may even get slightly corroded. Other parts of the brake system may also develop rust so then you may have other issues such as your calipers sticking. Because of the surface rust, the rotor is no longer smooth and can even has slightly raised areas where the rust forms, you may hear strange noises from your brakes while driving or braking. Avoid this problem by not letting your vehicle sit too long without driving it. 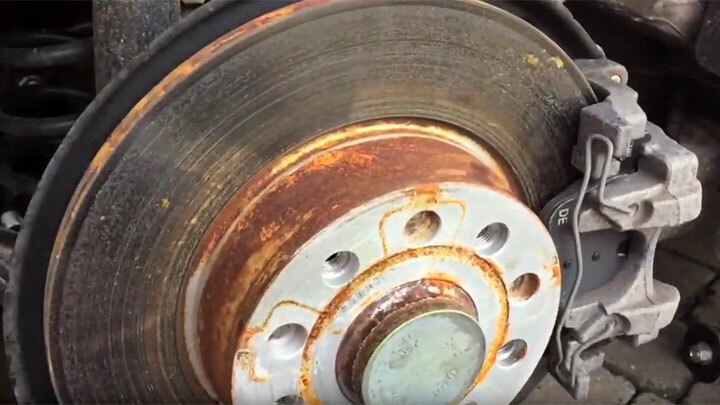 If a little bit of rust does form, it can often be cleared off by itself over time from the heat and friction of braking during normal driving. Too much rust will require resurfacing the rotors. If you have brake rotors that are worn or bad (warped, gouged, or cracked), they will make various sounds. Rotors that are warped and not flat will create squealing or squeaking noises. If the rotors are too worn, there may be scraping noises instead. On top of that, worn rotors will create a lot of vibration from the braking system. The vibrations may come at irregular patterns and your foot will be able to feel them through the brake pedal or your steering wheel will shake. Sometimes rotors can be resurfaced (or turned) if they are slightly warped but if they are simply past their lifespan, rotor replacement will be necessary. When installing brake pads, the brake pads’ backside need to be lubricated lightly using a brake caliper lube. 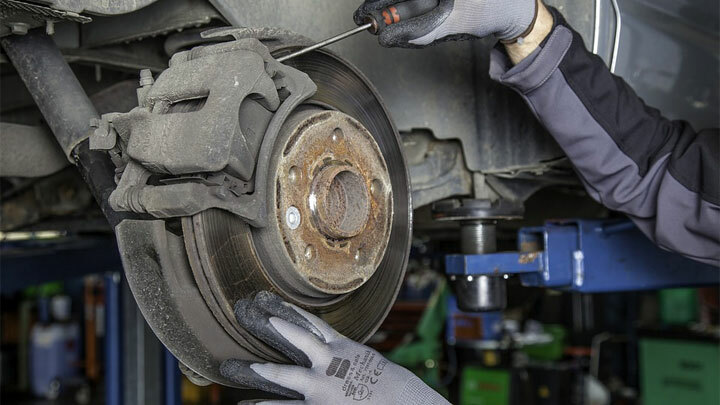 If this simple step is ignored, then the metal of the pads and metal of the caliper piston will come together when you apply the brakes and make squealing or rubbing sound. In addition, the caliper slider pins (which connect the two sides of the brake caliper together) should be generously lubricated before reinstalling. Brake caliper bolts should also be lubricated or else their slides will create sounds if they’re dry. This scenario is less likely to occur, but it could especially if it’s a DIY job. A reputable auto repair shop will at the least lubricate the bolts and often provide brand new bolts. This is probably the least likely reason for having brake noises. If grinding sounds can be heard from your wheels or if you experience vibrations which alternate from loud to quiet, then you could simply have a bad wheel bearing. In addition to the noise, you’ll likely feel vibrations in your steering wheel while driving. Question, 2006 Honda Element, Rear passenger noise when driving in Am out of driveway, flapping noise like something hitting wheel. Went to mechanic this weekend, diagnosed bad rear caliper, so changed it and replaced pads in rear as well. This morning, same noise is happening. Have to bring it back to mechanic. Any thoughts what is still causing this flapping noise from rear passenger wheel? Thanks so much for this info. I’ve been researching a noise on my 2015 Nissan VersaSL Note that suddenly got much worse today. It sounds like someone sharpening a huge knife! I can tell it’s metal against metal by the scraping, grinding sound. I think I heard a regular tock-tock-tock sound before this developed, so I may have a CV boot/joint issue, too. The grinding noise occurs while driving forward, NOT while applying brakes. It does not worsen Upon turning ,esp. L turn when it’s barely audible. I e tried to inspect it for grease in wheel well, but I can’t get to it. So far, no steering wheel vibration. Hopefully, bringing it in for work tomorrow ASAP will avoid any further rotor damage. 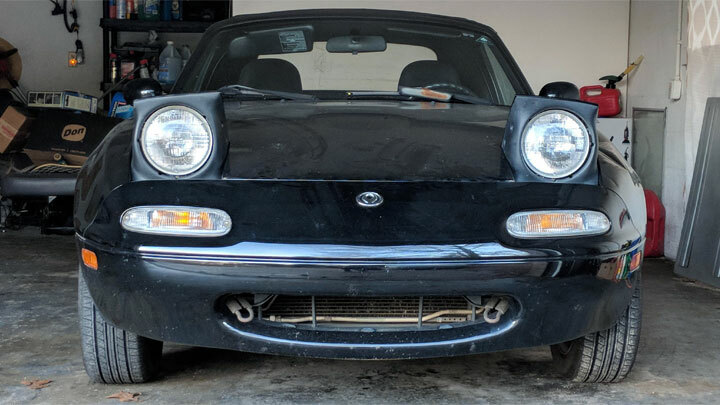 This is a cheap built in Mexico car. 52K gentle miles shouldn’t result in this problem, but hey, that’s the world we’re living in, right? Thank you VERY much for the thorough article. It’s a great help.